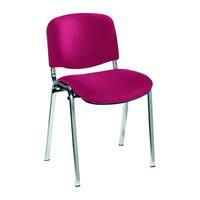 These chairs are a versatile answer to all of your seating needs, combining comfort with practicality. They can be stacked for easy storage, meaning that they are perfect for meeting rooms and conferences where you may need to switch the seating around. <br><br>The chairs feature an elegant design that provides support to the upper back and provides a cushioned, soft seat upholstered in claret. The legs are made from tough chrome-finish metal to ensure that they will not buckle or break.